Mrs. Helen T. Kimble died peacefully at Redwood of Kansas City on October 3, 2018 at the age of 80. Helen is survived by her loving husband, Sampson “Ken” Kimble. Helen is preceded in death by her father, Andy Smith (Chestnut, LA), mother Lizzie Smith (Houston, TX), daughter Debra Joyner (Kansas City, MO), on Douglas Wayne Joyner (Kansas City, MO), brother Charles Smith (Houston, TX) and Willie Smith, Sr. (Houston, TX). Helen was born on May 3, 1938, in Natchitoches Parish, LA to Andy & Lizzie Smith. She graduated from Natchitoches Parish Schools in 1956. After the home going of her infant daughter Debra, Helen welcomed her son. She was a devoted mother who always encouraged Douglas to follow a Christian life and to pursue his goals. Helen had her heart set on moving to Kansas City, MO, where she met the love of her life Sampson Kimble, an Assembler for the railroad and Groundskeeper for Kansas City Parks and Recreation. They were married in 1976. After moving to Kansas City, Helen began working for Rival as a Plant Assembler. Helen was a people person. She loved her family and church. She was generous with a servant heart. Helen loved to have fun. She loved fishing with the KAN-MO Line Dippers, traveling, and playing exciting games! Helen was an active member of the Fellowship Right Baptist Church and a dedicated member of the Mother Board. 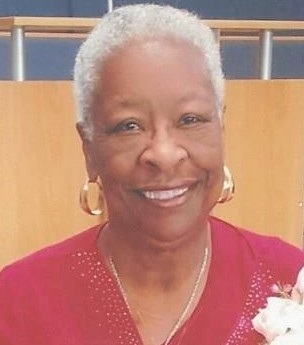 Helen’s beautiful life will forever be cherished in the lives of her husband, Sampson “Ken” Kimble; four grandchildren,DuShaiJoyner (Hesperia, CA), Jason Shelton (Palmdale, CA), Amina Ricca (Kansas City, MO) and Keisha Haynes (Kansas City, MO); seven great-grandchildren; brother,Frank Smith (Atlanta, GA) and sister, Christine Smith (Houston, TX); brother-in-law: Lavarn (Arlene) Kimble (Kansas City, MO); sister-in-law, Clara Perry (Kansas City, MO); aunt, Ruth Culberson of El Paso; and a host of devoted nieces, nephews, in-laws cousins and friends. A funeral is scheduled for Thursday, October 11, 2018, 10:00 am at Fellowship Right Baptist Church. Lawrence Nevels, Senior Pastor will officiate the ceremony. All are welcome to attend and celebrate Helen's life. The family would like to thank Redwoods of Kansas City Staff for their care.